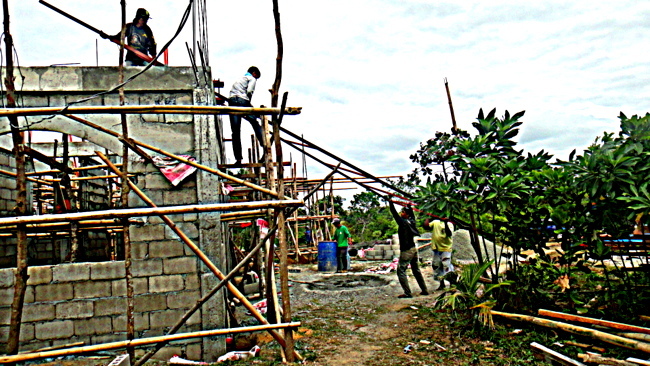 Construction costs for our new home in the Philippines is the topic for today’s post. 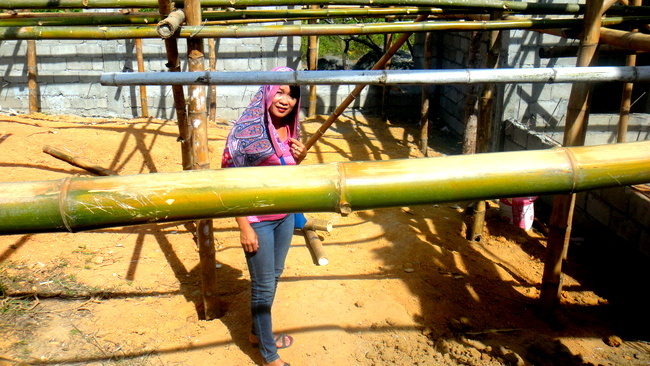 I took new pictures of our job site a few days ago and a recent comment from Kevin prompted me to confer with my asawa, who is in charge of buying materials for our house and handling our construction crew’s salaries, to check on our ongoing construction costs. My wife handles these chores in addition to taking care of her father, afflicted with dementia, and running a household of six people. Me? I stay out of the way and do as little as possible, something I’m exceptionally good at. My first photo is a close-up of the concrete that our construction crew uses. I thought one of my contractor experts, Bill S., could glean some information from this because it doesn’t mean much to me. I have heard, however, of “portland” cement, which is manufactured from limestone and clay that hardens under water and is the most common type in general use around the world. Hey, as long as it holds Cousin Emma’s hollow blocks together, that works for me. 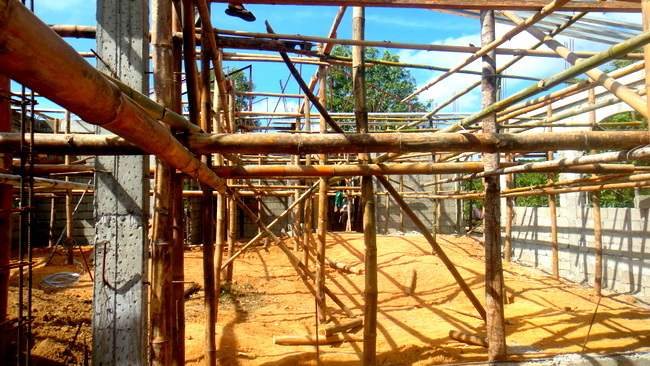 As regular readers of Philippines Plus know, I have very little knowledge of building and limited carpentry skills. I rely on the expertise of those who really do know what they’re doing. 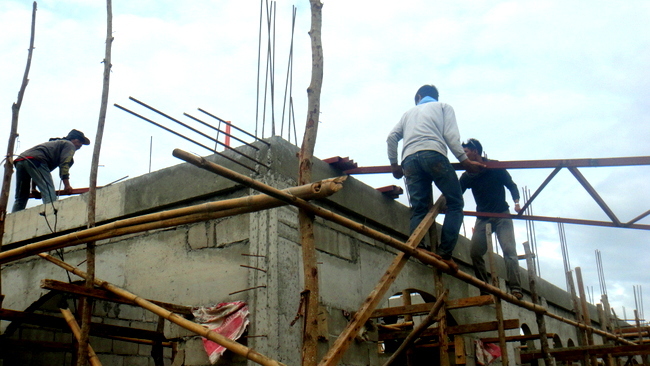 Our foreman, Boy, is considered by many foreigners on our island of Guimaras to be the best builder on the island. My brother-in-law Joery is in charge of a side crew that that built the nipa hut on our property where my father-in-law will reside. Joery, Jon and Gerry have constructed the tower for our new water tank (work on a well for our property will begin next month), and are now building a barbed wire fence that will surround our 1.25 hectares, approximately three acres. 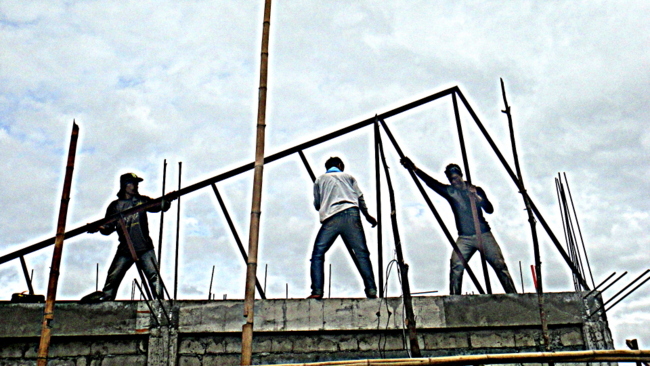 The crew starting bringing up the steel trusses they had welded. I stayed out of the way. I marveled at the way these workers wrangled with these heavy pieces and managed to haul them up without dropping them. Can you imagine what OSHA, the Occupational Safety and Health Administration back in the States, would have had to say about this? Thankfully no one on our 20-man crew has been hurt thus far and we hope this trend continues. The guys are working under the summer sun with high temperatures in the upper 80’s and humidity around 71%. We haven’t even hit March, April and May, where high temperatures will easily push into the upper 90’s by May. 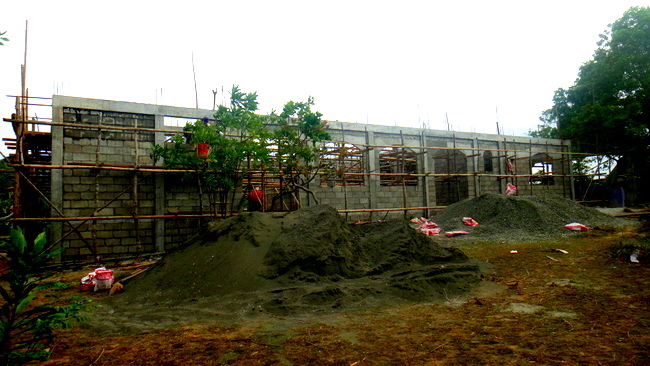 The trusses cost 306,000 pesos, almost 7,000 US Dollars. 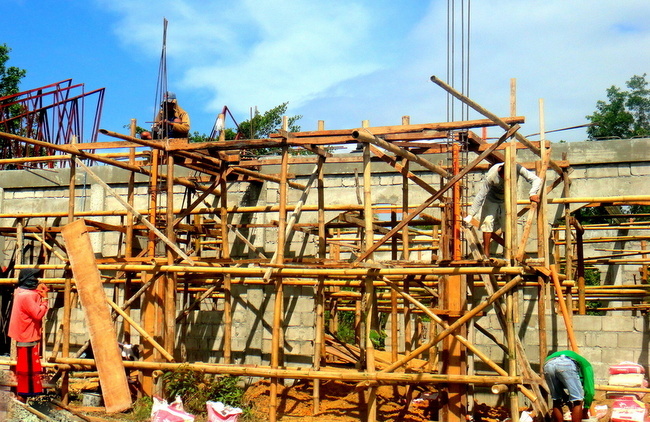 We will use 7,000 hollow blocks and they are being delivered in lots of 500 to 1,000 as fast as Cousin Emma’s Hollow Block Factory can manufacture them at a cost of 14 pesos each, approximately 98,000 pesos, 2, 225 USD. Most of the trusses are up now. 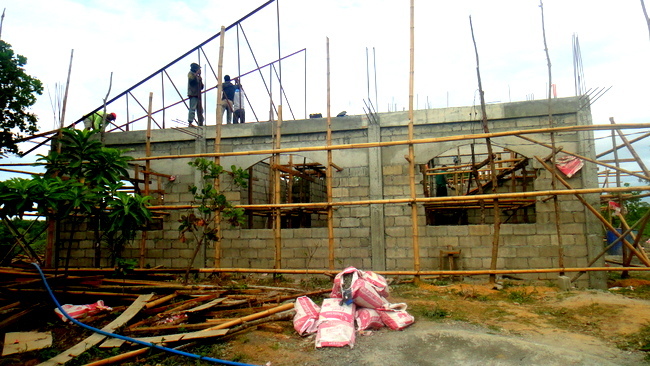 The next major expense for our new house in the Philippines will be our metal roof. It won’t be long until my wife and our foreman will be canvassing our region to get the best prices for a new metal roof. We will opt for a metal roof and not a tile roof. Though I know a light-colored roof will reflect back more heat and help cool our new home, I know my asawa is keen on having a darker-colored roof in a red shade though we will be insulating the roof, no matter what color it is. Here’s a look at the front of our new abode. The total square footage will be over 3,000 square feet. The structure will only have one story and will also have a covered garage area to park our Ford Ranger. This is a back view of our new home. Construction began on January 20th of this year. Thus far, our total expenses, including all materials and salaries for our workers, is approaching 29,000 US Dollars, 1.275 million pesos. 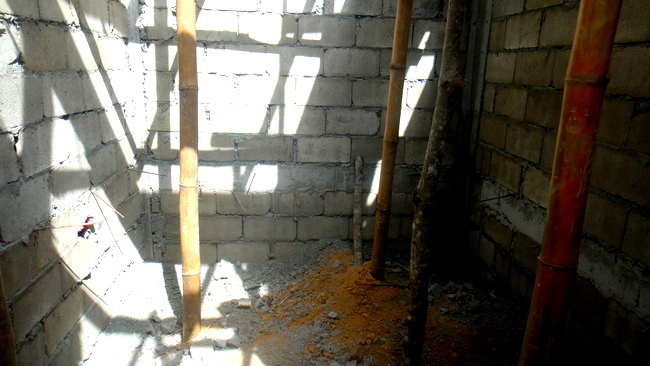 Our foreman originally told us that the house would be built in five or six months. To my untrained eye, it looks like our construction crew is making good progress. As mentioned earlier, the next major expense for our new house, aside from the weekly salaries which run around 35,000 pesos a week, 800 US Dollars, will be the roof. Here’s an interior view of our new living room/dining area. It will be the largest area in our new digs as my wife, seen below, protecting herself from the blazing sun, wanted a huge area where the family could gather to eat and to watch television and sing karaoke, of course. I’ll close with a look at my future office which is adjacent to our master bedroom. Not a large space but tucked away in the back of the house far from my father-in-law’s nipa hut. The new space will have enough room for my computer and I’ll have a television on the wall with a new Sony PlayStation hooked up to it. With the PlayStation’s volume cranked up and my distance from my father-in-law’s digs, I’ll hopefully have a sanctuary where I won’t have to listen to Lolo’s never-ending loud conversations with his dead relatives. Let’s hope our crew keeps on schedule. 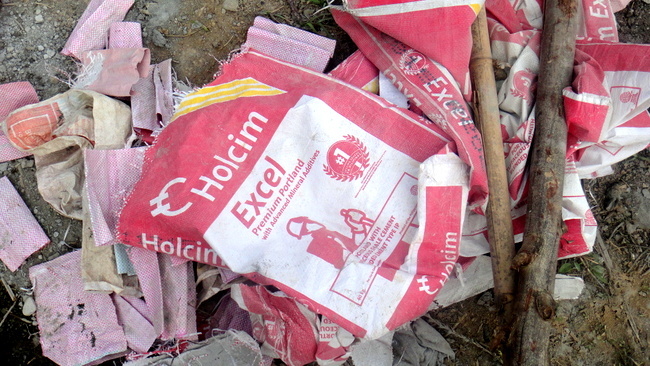 Does not mean much to me either, as far as I know cement is cement no matter where it comes from. I now know you have little knowledge of residential construction practices ,so figured it best to just read your stories and not ask stupid and or boring questions that 999 out of 1000 people could care less about, only construction geeks like me would care, if even then. Although its too early for us to seriously be looking for land down here in Davao area, outside of the city, where its hopefully more quiet except for the damn roosters crowing. We have spent spent a couple days riding around looking at whats available if the time comes we decide to build a place here, once I can move here for good. Have not seen any prices even close to those you paid there though so far. I have yet to ever see one old fashioned garage door here, I dont know why people only build car ports here and not garages, would cost very little more to have an actual garage thats securely closed and lockable. Maybe you can enlighten me to the car port thingy here. They seem to be moving along well so far! Bill S, land can be pricey especially when the word gets out that a “kano” is looking to buy land. We were fortunate in that my wife made a random remark to a new manicurist she visited who happened to be a “real estate” agent as many people seem to be once they know you are looking to buy property. I had my reservations but the “agent” and the seller turned out to be the real deal. Supposedly the land we bought had been selling for twice the price we purchased it for but hadn’t sold. I would hazard a guess that if a person is willing to look in more remote rural areas as we did, you might be able to get a good deal. I have not seen in any garage doors, either, Bill. I will have to check with my asawa to see if she can give me her insight on the subject. Here’s a LINK which shows that some foreigners here do have such contraptions but I have never seen any on our little island or nearby Panay Island where the big city of Iloilo is located. I forget, this is a place that if you cant find, have it made to your specifications. We looked at a small Cacao farm a few days ago I kinda liked, but I have no interest in farming, but it has 2 caretakers that can come with it, so who knows. We have been selling machinery, heavy equipment and most things in the house for about 10 months now, and much of it has been sold, so will be putting the house, land and shop on the market when we get back home, but real estate agents tell me it will be a slow sale most likely, so is hard to make any real plans til its all sold, then it will be chaos trying to get everything done for a move to here with at least one container. I at least now have a much better idea of what to bring here vs what I can and cant find here, since that is what much of this trip is all about, finding things here, and finding what I will have to learn to live without. Just in the 6 weeks we are here I am finding myself getting very bored at times, so to bring things for hobbies is also at the top of the list I think. I guess I will go back to doing stained glass projects, but seems I will have to bring all it with me, can find no source for hardly any kinds of glass, or lead came and other consumables. Good luck on selling your house, Bill S. We were fortunate to sell ours back in the States before that big housing market crash several years back. You were smart to scout around to see what you would need to bring with you to the PH and you’re really wise in having a hobby. If not for this website that I’ve been “working” on for five years I would have gone stark raving mad by now. Some would say I already am. As regular readers of this website know, my wife, maid and our extended family here do everything for me. I find it difficult to even wash my coffee cup in the morning without someone wanting to do that monumental task for me. Having a hobby or having something constructive to do once you move here is absolutely essential in my books. I would love to have some stained glass windows in our new home Bill. I will have to see if that’s even feasible in our neck of the woods. Thanks, Rease. 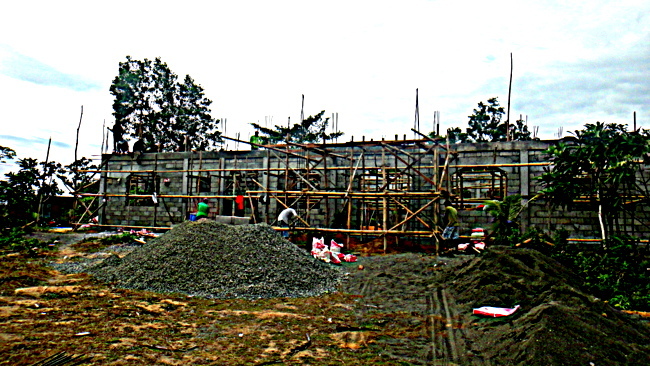 Yep, I was excited to see the nipa hut go up but to see the progress being made on the new house is exciting to watch. We might be popping into Iloilo next week, I will let you know in advance. Take care. You’re right about that, Derek. My wife worked for years overseas, many times without one single day off. Now she still keeps busy with the new house and our present household of six. I really want the house to be a small reward for all of the sacrifices she has made in her life. Looking good. We were looking at houses in a upscale development in December and saw some of the houses with US style garages, first I’ve seen that here. Yep, I’ve never seen any US style garages yet, Papa Duck. Melinda says most people have the open carports because of the heat. We don’t have plans to have an American-style garage either. Good luck on your search.